The return of a familiar face! Radha is proud of her warhost. With the elves contributing to not an insignificant portion of it. The elves had come to her timidly at first after the fall of Skyshroud. Only a few joined willingly while the others wanted to maintain a safe distance away from her while still benefiting from her protection. Radha had allowed that and as she expected, the presence of a elven camp attracted even more elves to her. So much so that the elves now made up a third of her army. Three elves rise as she approaches, elves that represent the whole group. What they want is time and resources to built a wooden hall to wait out the winter. They tell her they will die if they continue on. There are enough of them still strong enough to gather and hunt for the rest before they have to hole up inside. They can provide for themselves. "No you won't," Radha said. "You're going to break down this shantytown and get ready to march. We leave tomorrow morning." She sneered at the elf on the left. "You don't owe me thanks, you owe me obedience. you asked for my protection and I made you part of my 'host. This is how I treat my 'host. I keep you alive, and you follow my lead." The elven ranger Llanach pleads to her, and her response is a backhand to the face. Another proudly claims that they are not Keldons, but are of Skyshroud. Radha shatters his pride when she stabs him in the ribs and then places her knife at another elf's throat when he protests. Freyalise is gone, as is Skyshroud. All that's left is her. If they need protection she will provide it. Radha roars and summons her fire. She channels it down her arms and engulfs the elven representatives in the orange flame. There are shrieks of panic until they realize that no one is being burned. The mana of the Skyshroud rift is no longer hers to command, but she has learned to adapt the mana of Keld to her purposes and is improving with her skill by the day. Her new healing wasn't as good as channeling green mana, the elves still have scars when she's through, but the cuts are healed and their aches will be gone in a few days. She calls out the elves and tells them that Skyshroud is gone, but but they will survive. She will make Keldons of them all. If they have any sick or wounded or blistered feet, they should come to her and they will be healed. They march in the morning and will not stop until the reach the shores and the abandoned Keldon town that awaits them. It's there that they will rebuild. The situation is taken care of just in time. Radha senses a familiar magic and power in the air. Jeska watches the Keldon elf and isn't impressed. She was used to others referring to her own Pardic people by the term barbarian because of their rough code of justice, but watching Radha bully her own warriors shows her that these Keldons fit the more bloodthirsty definition of the word. But maybe Jeska can use that to her advantage. If she can just prove to Radha that she is the stronger of the two, that may convince her to give allegiance to herself much like how Radha demands the same of others. Jeska materializes and declares herself to be Jeska of Otaria. Radha tells he that whatever she wants, the answer is "no." Of course that's not enough that to dissuade Jeska, but Radha isn't in the mood to waste time. She wants Jeska to get straight to the point. The planeswalker tells her that the others said she was important and she wanted to take a look for herself. Jeska did not reply. 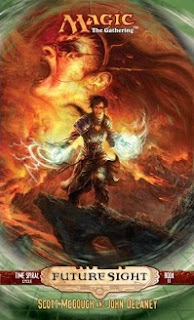 She was staring at Radha, seeing the Keldon not as flesh and blood but as a collection of magical energy and potential. Radha was steeped in the fires of Keld, but Jeska saw an absence in the pattern, a space that until recently had been filled with rich green mana. 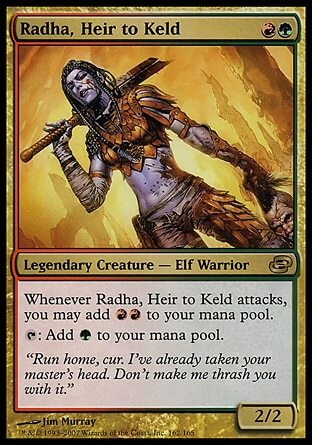 The elf within Radha must be drowning in the overwhelming abundance of Keldon magic. Jeska's too shocked when Radha simply strides forward and pushes her aside. This isn't going well. Jeska declares that Radha will help her. She can bring her warhost with her if she wants, but she will have her help when this is all over and done with. When Radha declares that she's heard this all before, done this all before, and no amount of effort on their part has changed anything. She's done with trying to save the multiverse and instead chooses to just live as she's always wanted. Jeska declares her to be a coward and challenges her to open combat. A fair battle where she reduces her strength to only what she was when she was a normal Pardic warrior. If she wins, Radha must heel. The Keldon elf scoffs at the idea of laying stakes to a duel. Fighting to the death is the only thing that makes sense. The imminent duel is interrupted, however, when they both hear a scream of death coming from the center of the camp. Radha runs towards her tent and Jeska teleports after. This is quite a development. The caretaker, Freyalise, wasn't able to get Radha to heel. The scholar, Teferi, wasn't able to either. 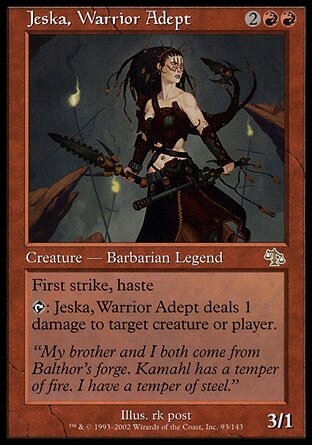 Will the warrior, Jeska, have any success? Highlighting the differences between the two warriors is obviously more important now than it ever was, now that it seems that these two may be pairing up for this book. While the Jeska history of Chapter 3 wasn't too thrilling to read since it was recapping things I mostly knew, I do like what I'm seeing from Karn's apprentice planeswalker.